Some good stuff here. Thanks for sharing, guys! I found a Stack On with 17 deep compartments, a locking cover, and a single-piece molded handle. 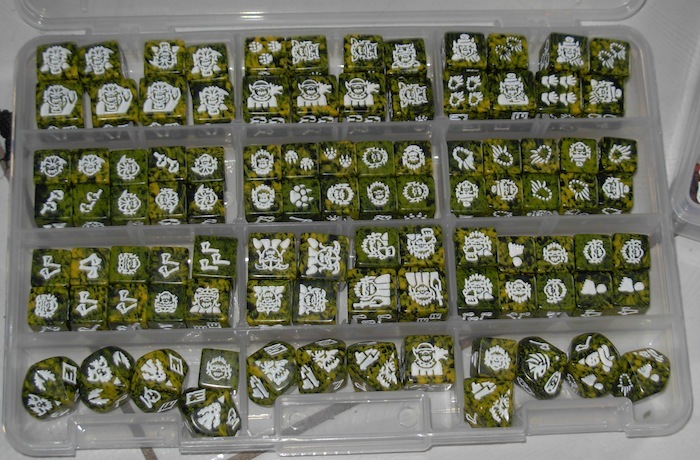 Sturdy, with enough space in the compartments to rustle through the dice. It's about the size of an attache case, and the cover is clear so I can see the dice. This took me about 5 hours to do. I took a box from Goodwill and printed out all the skills and races from sfr pdf rules and from my 2 player starter pack I made a copy of it on my printer. I use card stock paper to print everything out and use Elmers glue to glue it and coat it. I got cardboard from taco bell and now I am working on a battle field for Dragon Dice™ will post that when im done hope You guys like it. Wow! Wicked! Dragon Dice™ Coffer of Possibilities! Talking about a battlefield...you may want to try this link in the forum. These are awesome. 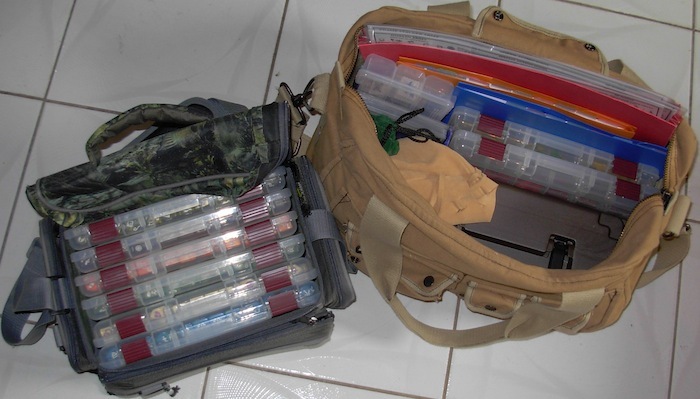 I've seen fishing tackle bags with 4-5 Plano boxes in them. I also have a craft box (embroidery/beads) with 4 boxes that's nice for carrying around a small set of dice. This bag holds (and comes with) 4 of the 3600, but nicely fits 6 of the skinnier 3601. Ok after years of keeping my dice in those pizza boxes, I decided to move them to a new storage box. I got a Husky 5 drawer tool box. It works perfectly. The top added a sixth storage area, just remember to leave room for the top to close and very important make sure the top can open fully. If the lock it the drawers are locked too, but if the top is not fully open after unlocking it the drawers my not unlock. 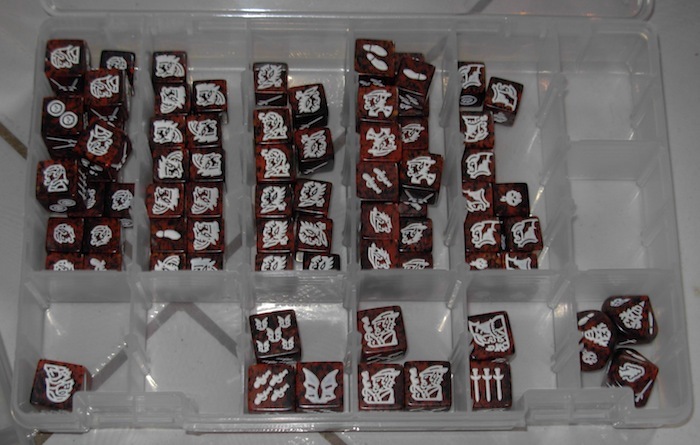 Moving them over is time consuming, and I spilled some but it is working out nicely as I had to take a re-inventory of my dice as DDassist was not installed on my laptop nor was my website up anymore. But as I am picking my way through and loading up the tool chest, moving things around I.... didn't check the bags. I found more six siders so reorganize again and fix counts again! Only half way through the count at this point. I've found these to be the perfect mix of price and convenience. One per army, separates out each unit fitting 12 for commons, 12 for uncommons, and 8 for rares of each. Fits about 14 monsters as well. Not a complete solution for my whole collection, but enough of each race to have at my finger tips for play. This is pretty neat and 50% off in stores right now, so its like 15 bucks. It has enough to hold about 2-3 races spread out, and the pull out tray is awesome for building armies or what not. This is what I use to store them now. With room to grow to about 2000 dice, 3 of these organizers hold my current collection (about 1400 dice, magic cards, dice bags) minus printed full rule books. They are outfitted with 2-size arrangeable/removable pockets. They are sturdy, stackable, relatively inexpensive, and about 15 pounds when full.